No one would consider setting off on a long road trip without a GPS or at least a map or two to guide them along the way. Yet, it’s amazing how many businesses attempt customer relationships without any type of guidance or customer journey map that would help them sell much quicker and easier. Far too often customers can’t find a clear path to engage with a business and may abandon any potential sale – simply because it’s too difficult to continue. In many cases, finding a product on a company’s website may not be intuitive and the customer will leave to go to another company’s site. The product was available but not in a way that made it easy to find based on the customer’s thought process. In cases like these, a lack of a clear journey, online and offline with a company ends in abandonment. A customer journey is just like that road trip mentioned earlier. It is a path of touchpoints that a customer takes with a brand on the way to a sale or after a sale. Most purchase decisions aren’t made immediately after learning about a new product. A potential customer may do some research after possibly seeing the product in a brochure or an ad. As interest intensifies, the prospect will seek other sources of information until the decision to purchase is reached. Using customer journey analytics, real insight into how a customer truly interacts with your brand can be discovered. A customer journey is more than a marketing strategy; it has huge potential for increased revenue and cost savings. Ultimately, a great customer journey is a series of relevant and supported customer experiences that affect the customer’s emotions and attitude towards a brand over the entire lifecycle of a customer. Savvy brands know that efficient touchpoints in a smart customer journey map make all the difference when it comes to generating more revenue both short- and long-term. Businesses must map the core part of the journey and identify breakpoints in the journey, paying closer attention to more complex transactions. It’s only in the critical last leg of the journey that customers directly interact with the business at a point of sale or critical point of contact (sales forms, renewals, loan applications, insurance claims, debt collection, billing disputes, etc). As customers engage with brands, they formulate their opinions based on these limited direct business interactions. A customer journey map is a visual representation of all customer touchpoints with a company. Whether the sale is for a retail product, consumer service or high-end enterprise solution, the goal is the same—projecting the path to a sale. Customer journey mapping can reveal a lot about the customer’s interactions and behaviors. When the journey map is supplemented with customer journey analytics which include customer needs, emotional ranges and other key metrics, a business will have real-time access to customer behavior and can make adjustments to improve the probability of a sale. Every customer journey map will be different but there are some common questions to consider before creating one. Are customer journey maps always strategic or can they be tactical? Does a customer journey map apply to all customers or can the customer segments and personas be narrowed down? Should a customer journey map capture cyclical behavior or stay strictly linear regarding customer experiences? Do customer journey maps need to be visual representations of the customer journey or can it look like a grid map? While there may be some overarching thoughts and opinions on what a customer journey map should be, there are a few components that should be considered when creating an effective customer journey mapping journey. A customer journey map should always be created from the customer’s perspective, not the view from inside the company. Journey maps should always be actionable with an inherent purpose. Create the customer journey across multiple touchpoints, not with a silos perspective. Be sure to include customer performance indicators such as moods, expectations, Net Promoter Score and other customer satisfaction measures. Craft the customer journey map to incorporate KPIs for important company stakeholders who will benefit most from the data. Creating a customer journey will evolve as your business changes and your customer engagement deepens, but the core components are reliable measures to build a strong journey map. Customer journey mapping is a realistic way to see how customer experiences line up with your brand promise. Are you delivering what you say you will? Can customers trust you? What things might be holding you back from long-term customer relationships? These questions and more deserve answers and that’s why it’s so important to create a customer journey map. Customer journey mapping not only provides a look at recent customer behavior, but allows for long-term projections and revisions to customer experiences to create better end results for everyone involved. Given the high-stakes and high rewards in improving the customer experience, businesses are looking to address critical CX gaps, especially in the last mile of the customer journey. Using customer journey mapping analytics businesses are realizing that they need to be able to complete critical last mile transactions simply, anywhere. There are basically six steps in the process of building a customer journey map. Remember that your map will be individualized to your business and customers, but these are great places to start. Engage company stakeholders. The more allies you can build across your business, the better the customer experiences will be. Everyone from all customer touchpoints will not only be prepared to support the mapping efforts, but will also be able to serve the customer appropriately when their time comes. Conduct customer research. At this phase, you’ll want to learn all you can about how customers feel when engaging with your company. Try to get a read on emotions, motivations, expectations, pain points, needs and questions they might have. Your survey methodology will vary based on your business but some types of formats used include in-person interviews, surveys, customer support and complaint logs, call center conversations, NPS data, social media conversations and more. Create your model. You can craft your customer journey map utilizing a template, many of which are available through software and app vendors. Some elements to include are: touchpoints, moments of truth, customer actions, channels, customer experience improvement opportunities and touchpoint ownership. Finesse the design. Solicit the help of a graphic design source to polish the look of your customer journey map. You’ll want to make it as professional as possible so that stakeholders will understand the importance of the work and engage appropriately. Refine the final product. Once you have the chance to get feedback on your customer journey map template, you’ll probably want to make some edits and incorporate new information where it’s relevant. So, what can a customer journey map template look like? There are many options from the most basic to the complex, but we’re sharing some popular ones below to get you started. Regardless of the type of customer journey mapping style you take, the main thing to remember is to start with the customer. Always look at your business from the customer’s point of view. Never stop researching. There’s always something to learn and one small thing could make a radical difference in your bottom line. Choose the map style that makes sense for your business. And don’t forget to engage all appropriate stakeholders. Everyone has a share in the customer and this is a great way for all departments to get involved with their distinctive perspectives. The customer journey mapping process is not a set-it-and-forget it proposition. It’s a dynamic document that should evolve as your business changes. As customer needs change, your products change and so should customer engagement as viewed on journey maps. The closer you are to your customers, the better you’ll be able to anticipate their needs, eliminate pain points and deliver satisfaction. And don’t just rely on the map itself, get into the habit of asking customers about their interactions and touchpoints with your company. Always be prepared to learn and be ready to incorporate that learning into new customer maps which will lead your business to more revenue. Once the customer journey map is completed, you will be able to identify critical moments in the journey and prioritize investments in the customer experience. In the digital age, much of the customer journey is happening independently. Today’s customers expect seamless, complete, simple interactions. They expect to be able to complete forms, share documents, sign and pay while on the go, from their cell phones, while they are multitasking. In short, customers expect experiences to match their digital lifestyle. Contact center agents assume that while customers are on the phone, or in a chat, they are attentive, at a desk and have many other tools at their disposal – like printers, scanners, or something as basic as pen an paper. As such, contact centers often ask customers to perform difficult tasks across multiple touchpoints just to complete simple last mile tasks. This last leg of the journey, aka the Last Mile, is often times long, painful and full of friction. A bad experience in the Last Mile can completely diminish the great experiences that have led to it, leaving the customer frustrated and dissatisfied. It’s precisely those ‘last mile’ interactions that determine whether a customer will buy a product, have their service requests tended to, and whether they will remain a loyal customer. 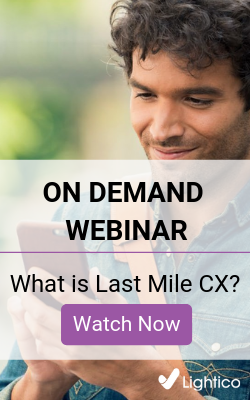 Want to Learn more about Last Mile Customer Experience? click here.